If you have water leaking into your basement, a perimeter drain could be the right option for you. At DBS, we offer a variety of interior drainage systems to help you keep your basement dry and clean. Our systems fit all types of foundations and floor slabs, and our experts will help you identify the best drain for your needs. Call us today at 1-855-259-9625 or click below to learn more about how we can help you. We offer free estimates on all basement drainage system installations in Duluth, Superior, Minneapolis and nearby. This might surprise you, but French drains don't originate from France at all! In fact, the concept was designed by Henry Flagg French in Massachusetts in the mid-1800s. A French drain is not a specific item per se, but rather a name for the space between a basement wall and the concrete slab that allows water to drain outside of the home rather than pool on the floor. Unfortunately, traditional French drains clog easily and often struggle to thoroughly remove water. Our basement drain systems take this drainage concept to the next level by using a wall flange that allows seepage to enter the drain and collects water off the walls to easily funnel it away from your foundation. Our drain systems also prevent debris from entering the drainage area and provide a clean finished appearance on your floor. Unfortunately, trench drains have the unintended consequence of allowing air from drainage channels and from the ground into the home. This air from the ground may contain hazardous radon gas, a naturally occurring radioactive gas. TrenchLock™ trench drain inserts are specially designed to block unwanted ground air and gasses from entering the basement and ultimately your home. TrenchLock™ is an insert that can be installed in an existing trench drain to allow water down without allowing air to come up. The system comes with balls that fit over the drainage holes, which create an airtight seal when there is no water. When water enters the drain, the ball floats to allow the water to drain, sinking back into place as the water drains out. This allows the drain to function perfectly without allowing air to enter. Let us install the drain system you need for your home! No matter how your house was constructed or what kinds of problems you're facing, our waterproofing products can provide a solution that's ideal for you! 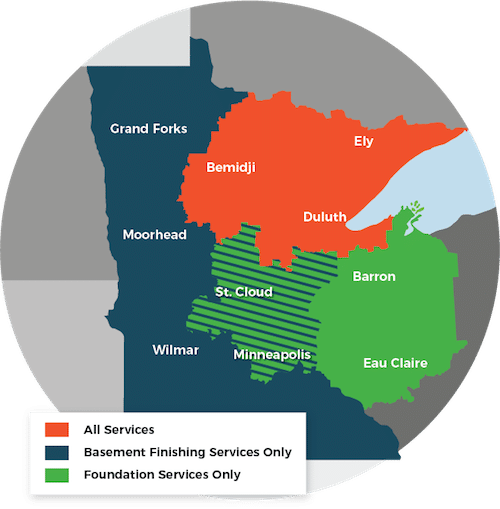 Call your local basement waterproofing experts at DBS today to get started with a free estimate in Two Harbors, Cloquet, St. Paul, Hermantown, Virginia, Ashland, Esko or nearby.